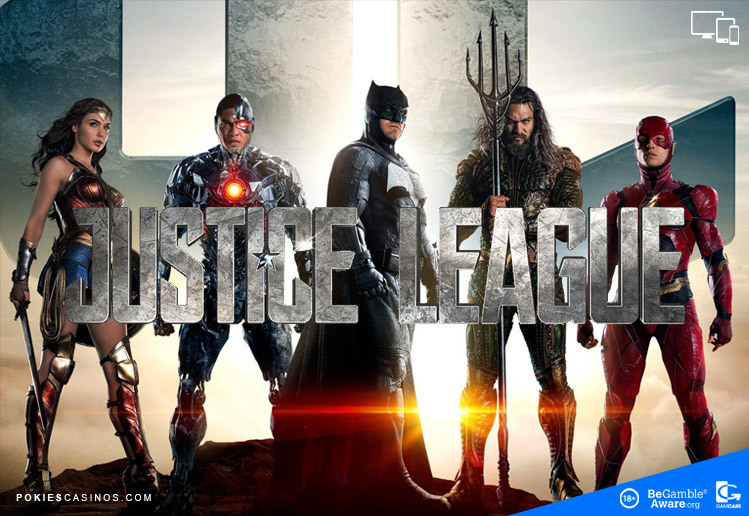 Justice League is powered by the well known software gaming company Playtech. This game has 40 paylines, 5 Reels and 3 Rows. Justice League is part of the DC Comics range, based on the blockbuster film of the same name. The superheroes include Aquaman, Batman, Cyborg, Superman, The Flash and Wonder Woman. The Superheroes team up to take on the unstoppable enemy Steppenwolf and his army of Para-demons who are determined to take over planet Earth. Justice League features re-spins, stacked wilds and special bonuses from each Superhero. The multi-level progressive jackpot can award a life-changing payout! The realistic graphics and soundtrack from the movie gives an entertaining and epic feel to the game. The betting range begins from 0.40 up to 2 000.00 per spin. The Wild symbol is the Justice League logo which substitutes for other symbols except the scatter. The Wild symbolizes the entire Superhero team. Together with each Superhero symbol, the Wild can appear fully stacked on the reels. The Scatter symbol is the powerful cube shapes called Mother Boxes. Scatter Symbols appear on the 1st, 3rd and 5th reels. 3 Scatters will trigger one of the 6 free spins modes. Free Spins – 6 Free Spins where a superhero can transform into a Wild symbol. Hero Re-spin – randomly awards a Re-spin with a superhero acting as a Wild. There are 6 Free Spin modes – each one is based on the 6 Superheroes together with Wild symbols. The free spins will be triggered by scatter symbols landing in a 2×2 feature frame. Batman: 2 free spins – if a Superhero symbol appears in the feature frame it will turn all other Superheroes on the screen Wild. Superman: 5 free spins; any Superhero landing in the expanded 2×2 feature frame will turn all of their own symbols Wild. In addition, a huge 2×2 feature frame appears on every free spin. Wonder Woman: 7 free spins, land a superhero in the feature frame which will turn all their symbols Wild. There are between 1 to 5 feature frames on each free spin. 2 or more scatters will re-trigger the feature awarding up to 14 free spins. Aquaman: 10 free spins, any symbol landing in the feature frame transforms all matching symbols Wild. 2 or more scatters will re-trigger the feature with up to 20 free spins. Cyborg: 12 free spins where any superhero symbol in the feature frame will turn matching superhero symbols Wild. An extra frame will appear after each free spin without a transformation. 2 or more scatters can-trigger the feature awarding up to 24 free spins. The Flash: 15 free spins, when a superhero symbol appears in the single feature frame, all Flash symbols on screen become Wild. 2 or more scatters re-trigger the feature to award up to 30 free spins. Re-spins can be triggered at random during the base game. Once activated, a frame will turn bright red on the reels, when a Superhero symbol lands in the frame it will become Wild and awards another spin. It is possible to land 5 consecutive Re-spins in a row as long as different Superheroes keep turning Wild! Justice League is part of the DC Super Heroes Progressive Jackpot network. Players will get the opportunity to win any of the 4 random progressive jackpots. The jackpots are the Mini, Minor, Major or Grand Jackpot. A new screen will open where Honeycombs will appear. Pick at them randomly, they will light up with different colours which refer to the jackpots. The AutoPlay spins the reels automatically from 10 up to 99 spins. Where to play Justice League Pokie Game. You can play Justice League pokie game at our recommended Playtech Internet casinos below.